As the primary governance instructor for Interface Technical Training, Mark has forged a national reputation as the ‘go to’ instructor for ITIL COBIT, ISO20000, Business Analysis, IT Strategy and several other disciplines. With over 20 years of professional experience, Mark’s background spans leadership roles from Datacenter CIO to Management and IT Consulting. Mark has led large teams in outsourced IT arrangements, conducted PMO, Service Management and governance activities for major project teams, managed enterprise applications implementations, and implemented governance processes across multiple industries. Mark has a wide array of industry experience with ‘Big Five’ consulting in the health care, manufacturing and distribution, services, high technology, and government verticals. Mark is a problem solver who is committed to solving hard problems and delivering excellent strategic results. Additionally, Mark has forged a reputable competency as a consultative trainer and speaker in several disciplines receiving exemplary evaluations. Mark acted as interim leadership for clients with a specific focus of organizational design, operational processes, and governance models. Typical engagements include assessments, hands-on implementation, and consultative training in the IT Service Management. Governance Controls and Technical Management domains.  Currently serves as the itSMF Kansas City LIG President as well as the itSMF national CobiT SIG president, and regularly speaks at association events. "Mark Thomas is very personal, knowledgeable and engaging. I enjoyed his real-world stories; it really helped us connect with the content!" GTRThis class is Guaranteed To Run.